FORMER AUTO INDUSTRY titan Carlos Ghosn has been granted bail at one billion yen (€7,893,849) after more than three months in a detention cell. Prosecutors appealed the decision of bail and could even file additional allegations against the 64-year-old to keep him from leaving detention. 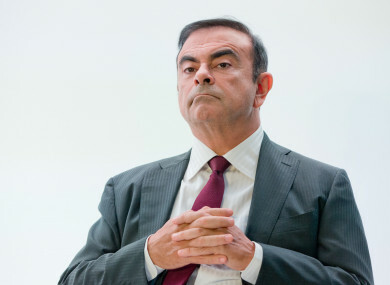 The former head of Nissan, Mitsubishi Motors and Renault faces three charges – two involving alleged under-reporting of his salary and a third over a complex scheme in which Ghosn allegedly sought to transfer his losses to Nissan’s books. The decision for bail came a day after Ghosn’s new lead defence lawyer, Junichiro Hironaka, told reporters he had filed a “convincing” application for bail that contained fresh elements. Speaking to reporters yesterday, Hironaka vowed a “completely new legal strategy” to obtain his client’s release. Email “Ex-Nissan chief Carlos Ghosn granted bail at €7.8 million in Japan”. Feedback on “Ex-Nissan chief Carlos Ghosn granted bail at €7.8 million in Japan”.